Our next meeting will be held on Sunday 25 June, from 11am at Kings Theatre Creative in Kawakawa (come earlier to grab a coffee from a local café). The meeting will be followed by NorthWrite 2017: National Flash Fiction Day Workshop and Readings. Lesley Marshall attended a book launch in Dunedin for Astride a Fierce Wind by Huberta Hellendoorn, edited by Lesley and published by Mākaro Press. She also held a workshop on editing. Wendy Megget has had an article ‘Taking your Garden from Paltry to Poultry’ published in the June issue of Kiwi Gardener, and has been contracted as a regular contributor. Derin Attwood is starting a new critiquing group. Details are on the Northland Events Page. Piet Nieuwland has had a poem, ‘Villa Schifanoja 1’, published in Landfall 223. Di Menefy participated in the Storylines tour of Northland. Early childhood centres were included for the first time. Di wrote a play and used puppets in her presentation, which was well received by the children. Donna Blaber has completed her Master of Creative Writing with First Class Honours. Congratulations Donna. 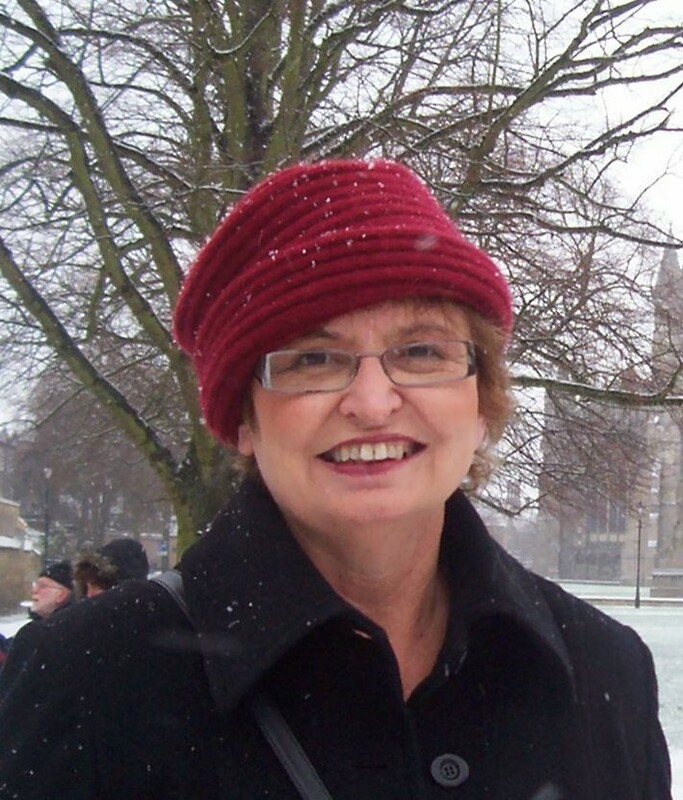 Kathie was the first secretary of the Northland Branch of the New Zealand Society of Authors when we started in 1996. After that she was on the committee for years and her bookshop Chapter 1 offered 10% discount to our members. Although she had very little time for it, Kathie was a good writer. One of her short stories was placed in the national competition run by the Northland branch, and she’d almost completed a novel before her health made it too difficult to work on it. I’ll always remember the launch of my first novel at Chapter 1 in the Town Basin – a special day that Kathie organised with her wonderful talent for bringing people together and making you feel special. Kathie enriched many lives and she will be missed. This month’s featured book is Jody Reynolds’ Crossing the Divide short story series. 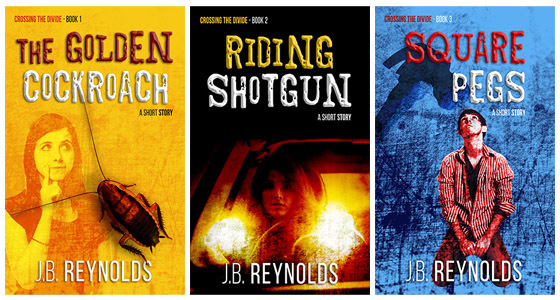 The Golden Cockroach, Riding Shotgun, and Square Pegs are the first three books in the Crossing the Divide short story series, written by J.B. Reynolds. Melding tragedy with comedy and switching between settings in Central Otago and Brisbane, each story focuses on a different character and explores that character’s struggle to connect with the people in their lives. Nina’s dinner date is an insufferable jerk who only wants to talk about himself, but an unexpected guest makes her evening out a memorable one. It’s Evelyn’s turn to drive her friends to work. But are they even her friends? The road to Queenstown is a treacherous one, and as the fog gets thicker, her thoughts get darker. Tired, thirsty, and frustrated, Darryl wants only two things – a beer, and to be left alone by his troublesome neighbours. Fate, however, has other ideas. Books 1 – 3 are available as ebooks from major ebook stores, with Book 4 due out later this year. Head to http://jbreynolds.net/ to find out more. This year’s NorthWrite event will be held at Kings Theatre Creative, Kawakawa, on 25 June 2017 in conjunction with National Flash Fiction Day. It will consist of a one-hour, flash fiction workshop, followed by flash fiction readings from Northland writers. Flash fiction writer, Vivian Thonger, will facilitate the workshop accompanied by improvised music from Ambients. The workshop will run from 1.30 – 2.30pm, followed by an afternoon tea break and then flash fiction readings from 3 – 4pm. The workshop is $10 per person and can be paid in cash on the day or by internet banking. If you wish to pay by internet banking, please complete the form on the NorthWrite page or email northlandauthors[at]gmail[dot]com. More information is available on the NorthWrite website. The Northland Branch 21st Anniversary will be held on Saturday, 2 December 2017. We will let you know the details closer to the time. Members are encouraged to visit www.Writeupnorth.co.nz for Northland writing updates and to send their writing news to admin[at]writeupnorth.co.nz. Members are also encouraged to use the Facebook group Writers Up North. Creative Junction is a new magazine with a Tai Tokerau focus. Please contact publisher and editor Pippa Bourke (pippa[at]creativejunction[dot]nz) for advertising enquiries or to share your news. There are also openings for writers to contribute.